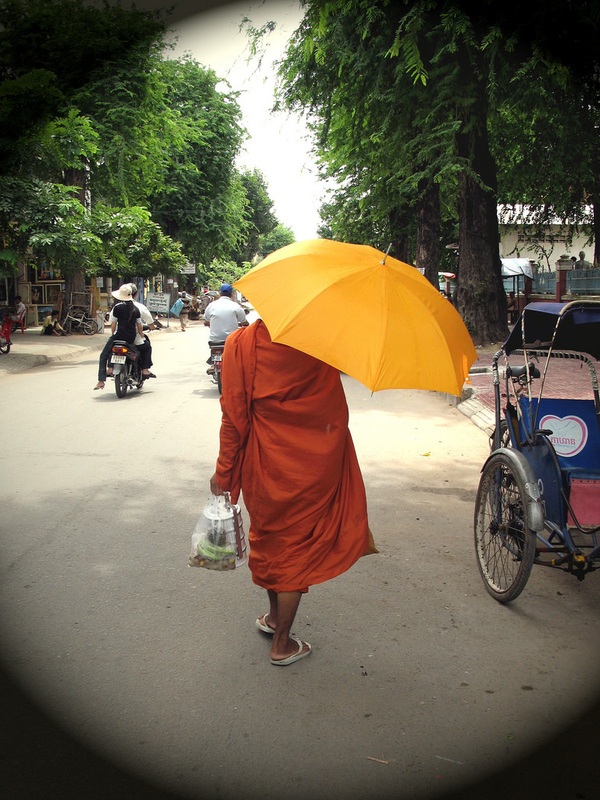 A monk keeps cool in Phnom Penh. We crossed the Vietnamese border into Cambodia by boat yesterday after having spent 2 days touring the fascinating Mekong Delta. Tomorrow we hop a noon bus to Siam Reap for a 3-day visit of Angkor Wat. I wish that I had not forgotten my camera cable at home, otherwise I could upload and post a few of the thousands of photos I have shot in the past 2+ weeks. We have traveled a long way and seen some gorgeous things along our route from Hanoi, Halong Bay, to Hue, Hoi An, Saigon, Can Tho, Chau Doc to Phnom Penh. For A and I the trip has been without any discomfort aside from heat rash -- it's SO humid and the sun is super strong and shines more than we expected during the supposed rainy season! Unfortunately the first week and a half were rough going for our traveling companions who both fell quite sick with a flu of some sort. They are now fully recovered. Well, that is all for now as the National Museum is calling us this morning and we have a date with the Royal Palace this afternoon. One day and a half is not a lot in this capital so we must make the most of it!